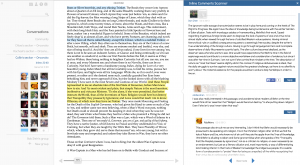 SocialBook is a platform for collaborative reading. Books appear in your web browser with a dynamic margin suitable for carrying on a substantive conversation. — In the open community. Just open the book and post comments or respond to others. — Invite a group of friends or colleagues to read privately with you. SocialBook is reasonably intuitive but here are some notes to help you get started. After signing in, choose “Read on your own within the open community” or if you want to invite specific people to read with you, choose “Create a group.” You can start in the open community and decide later to invite people to a private group. Once in the book you can add a comment to any bit of the text by selecting it, choosing “Add Note” and then typing your comment in the window on the left. You can save a comment as a draft to keep it private until you are ready to post it. 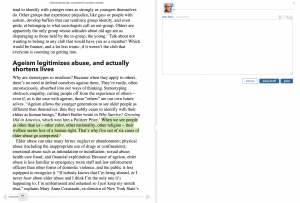 If you’re reading a print or e-version and want to comment in SocialBook, simply use SocialBook’s search function (upper left) to find the text you want to comment on.